I get that it might be nice to be able to build without worrying about building codes, but I am a retired plumber, and I have seen some pretty funky stuff. Not having building codes that builders have to follow opens the door to sub-standard work. How do you know your electrical wiring is properly grounded if it has not been inspected? What about your water heater or furnace? You want to take a chance on your "dream home" exploding to save some money on fees? Common sense and experience in construction make building codes nothing but a hassle and an affront to personal freedom in the case of an owner built home. 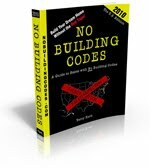 Most states do have mandatory building codes, but there are still 15 states where the existence of codes is a matter of local jurisdiction. Often it is the larger cities that opt for control of building practice, while the the more rural areas are freer. This is true in Alabama, Arkansas, Hawaii, Michigan, Missouri, North Dakota, South Dakota, and Wyoming. Some states have just a few counties that have yet to establish code requirements. In Arizona there is only one such county (Greenlee); in California there are three (Mendocino, Humbolt, and Nevada) that have adopted the liberal “Limited Density Rural Dwellings” program; Colorado has 15 open counties (including Saguache county where I live); Iowa has eight free counties; Mississippi is mostly free, except for coastal areas where wind and flood codes are enforced. Special cases are Tennessee, which is now in transition from having no codes to having mandatory control, and Texas, which does have state codes, but enforcement seems to be very lax. Of course the situation is always changing, so it behooves anyone planning to move to a code-free region to find out specifically what the situation is there. People who are interested in counties with no building codes generally are owner builders, or people who are trying to build sustainable housing using untraditional building pratices such as Earth Bag, Cob, or Staw Bail. The information contained in this book should be free, because it will contribute to more people having this information, and utilizing it to build their sustainable homes. Once more intelligent building practices become more previlent, we can buck the current code system and start a renaissance of smart building construction. Its the new economic boom, and the way out of national debt. People can spend two or three years building a nice home using Ecotecture, or they can have a 30+year mortgage. The system has ruined our economy, we need to get back to the basics, and share as much information with anyone who is interested free of charge. I am happy to hear that Colorado has a whopping 15 counties that go easy on you with building codes. Can you please tel me what those counties are? I am looking to buy land in Colorado and any information you can give would be a blessing. Thank you! The only county in Colorado that I am sure doesn't have building codes is Saguache county...and that is because that's where I live! I been a builder for 30 years and have a degree is Architectural Engineering & Design. There are so many ridiculous codes these days written by people who have little to none real life experience. We all end up being governed by codes based on ridiculous assertions. Codes are being written based on what a select few think could happen in an extreme and highly unlikely scenario rather than experienced determinations relative to real world likelihood. I for one am so sick & tired of it I get physically ill and disgusted. Too many codes goes right to the heart of matters which are rampantly destroying our freedoms in America. Besides what it boils down to is the same old thing that's been dictating our democracy for years... the almighty dollar. More codes means more government $ money $. Gotta keep that big river of money flowing. Unfortunately that river flows away from most of us. There is another county in Arizona that I did not see listed on the website, but conditions apply. Cochise county in Southern Arizonal has code and permits, but the allow owner-builders who have at least 4 acres of property to opt out of the permitting and inspection process. The only exception to this is septic. I would assume that anyone who is goign to be connected to the grid would also need an electrical inspection. This is relatively recent action that was designed to encourage people to build using alternative techniques. You can find the information on the Cochise County website. Nevada County in California seems to have a very strict building code. Recently, february 2012, I went to ask questions at the N.C. Planning dept. about small/tiny houses, septic vs. compost toilet, and grey-water systems. The only idea/conversation that was not shot down was grey-water with consideration to a plan-maybe. A real estate agent also told me that getting paperwork for sales/verification on septic systems...etc..on properties takes about 2 weeks! I am under contract for a plot of land in Canon City Colorado. It's actually Fremont County. I was so excited to leave Denver and live in my camper while fixing up an old train car that was turned into a 'home' at some point, then abandoned. I'm going to have to back out b/c I can't execute any of my ideas because of a never ending list of restrictions. I was even warned by a 70 year old resident who had a home in the mountains. I would be forced to hook up to the city sewer and water (50K), I can't build or live in anything on wheels (tiny houses). I can't compost. So discouraged by Colorado.